Nokia has launched two new entry-level phones, C1-01 (left) and C1-02, in the Indian market. Priced at Rs. 2,789 and Rs. 2,394 respectively, the C1-01 and C1-02 offer Ovi Life Tools capability with one month free access, aiming to bring education, entertainment, and news to consumers from both rural and urban regions. The service is available in 11 languages. Interestingly, the phones do not offer dual-SIM capabilities, unlike some of their recent brethren, however, they do provide up to 32GB of storage expandability with microSD cards - something rare at the price range. 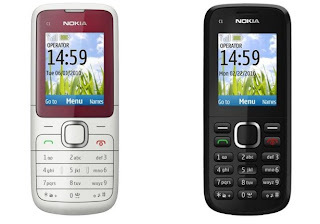 The Nokia C1-01 is being specially launched with an exclusive offer from Bharti Airtel, where users can get local and STD call rates of 40p/min, 250 night minutes of Airtel-to-Airtel talktime, as well as 50 MB data usage and 500 SMSes (local & national), all of which are valid for 30 days. The two new phones are meant to appeal to variety of users, featuring a variety of colours, built-in music players, as well as FM radio with recording. The Nokia C1-01 in addition as has VGA camera. Common offerings of the Nokia C1-01 and the C1-02 feature phones include GPRS/EDGE connectivity for mobile internet, MMS support, as well as microUSB and Bluetooth connectivity.